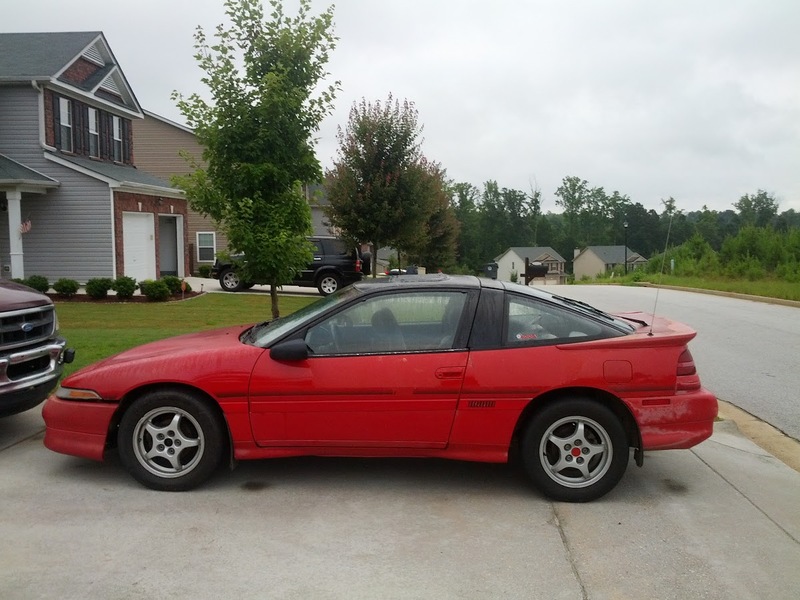 With race day two weeks away, the GSX is fully assembled, but won't start. My original goal was to have the car running two weeks before the race so that I could troubleshoot any issues that arose from daily driving. Well, it looks like the troubleshooting is going to begin before she gets driven anywhere. An engine needs 3 things to run: air, fuel, and spark. I'm obviously missing at least 1 of them. Follow me after the jump as I sort through each one to get this car going. Air is the easiest requirement to check, so I started there. Before I buttoned up the timing system, I performed a compression check to make sure everything looked good. Results were 150, 155, 155, and 160, so it looks like the valves are operating correctly. I confirmed that the throttle plate is functioning correctly and a quick visual check of the intake doesn't show any obvious blockage. Its safe to assume that air is making its way into the engine. I don't have a second person around to crank the car while I hold the spark plug to the block, so I can't check it 100%. I reconnect all of the plug wires and check the harness connections before moving onto the fuel system. 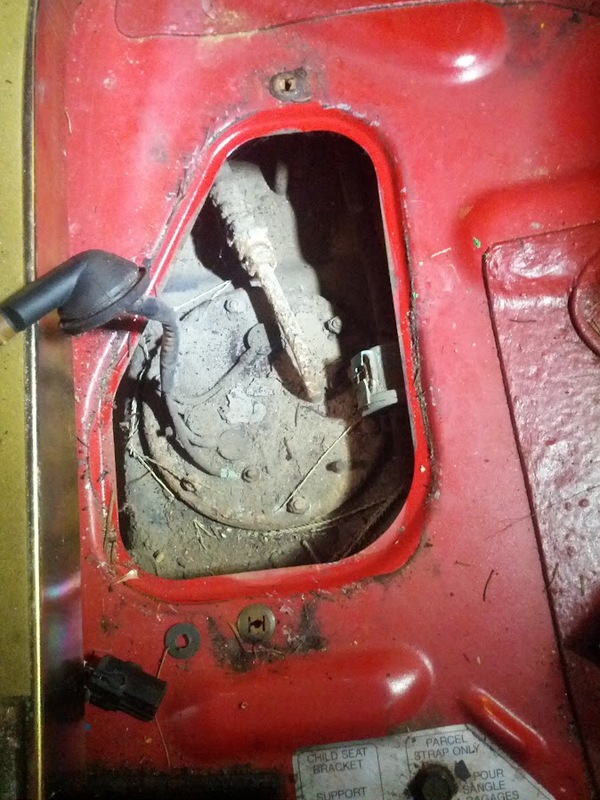 Loosening the fuel line connection to the main fuel rail reveals that it is as dry as a bone. The pump must not be sending fuel to the motor. The power path for the pump starts at the battery, goes through a relay into the ECU and then to the pump. I'll check each part to see where the break is. I know the battery is good, so I take it to the trunk and apply 12 volts directly to the pump harness. I can't hear it running, so the pump must be bad. There is a convenient access panel for the fuel pump in the trunk. I can only assume the dirt is now a structural component of the pump assembly. After removing the access panel to the pump, I can't believe the whole assembly hasn't disintegrated. The whole thing is caked with dirt and rust - I'd be more surprised if it did work. At least its an easy part to access and replace. While I'm waiting for a new pump to be shipped, I'll go ahead and check the ECU and relay just to be safe. 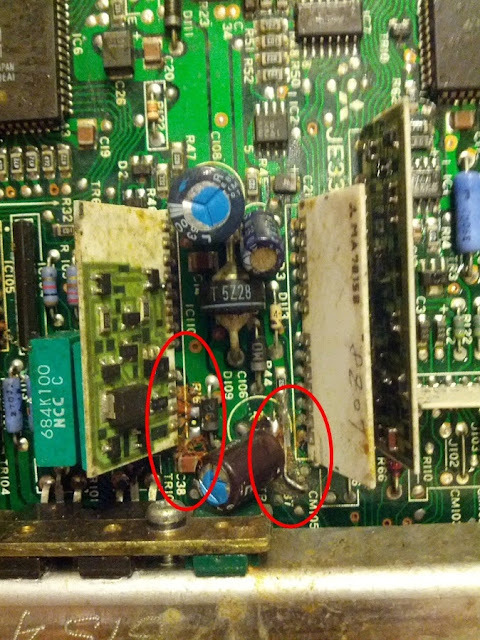 The tilted capacitor spilled its acidic guts on the ECU circuit board. Its a common problem on 1st gen dsm's. The ECU lives behind a couple of interior panels and is easy to get to with a screwdriver. After the case has been removed, its pretty obvious that the ECU is shot. There is capacitor acid spilled on several of the connections. This is apparently pretty common in 1g DSM's, so its disappointing, but not surprising. Again, at least its easy to replace. The relay checks out just fine using voltage from the battery. The cheapest part of the 3 is the only one working - go figure. "Did your car pass emissions?" 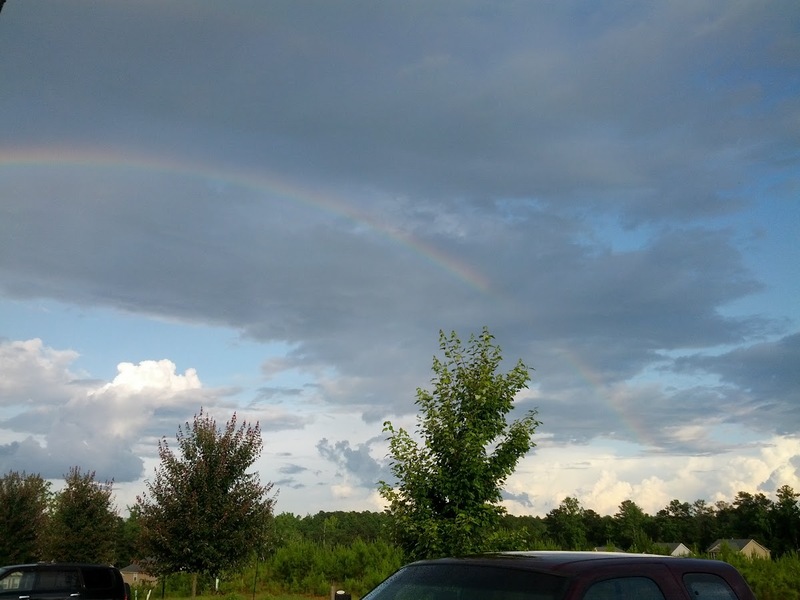 "No word yet, but rainbows appear in the sky when I start it." A sign from the heavens had been bestowed upon my car and I relished the moment. Then I smelled smoke. Then I saw smoke...coming from under the hood. I grabbed the fire extinguisher, shut the car off and ran towards the engine bay. I tested the hood with the back of my hand to make sure it wasn't too hot and flung the hood open. No flames, which was a relief. The smoke was due to some errant oil. Actually, a lot of stray oil. 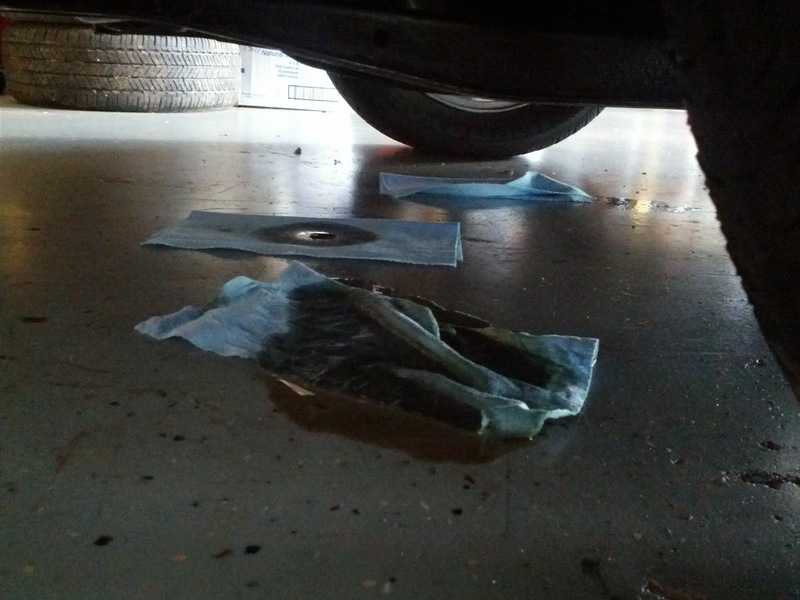 There was oil leaking into the timing cover and onto the block, which was creating the smoke and also meant I needed to replace the belt and probably some seals as well. With only 9 days left to race day, I was running out of time. I have my job during the week and a wedding to attend the coming weekend, so I wouldn't be in garage much over the next two weeks. Time to take this to the professionals. The Eclipse was kind enough to start the next morning and I was able to make it the couple of miles to the mechanic before the oil ran dry. Along the way, I learned that the car won't go into 2nd gear, so I'll have them look into that as well.